Celeste is incredible and I can't recommend her enough! She immediately understood my vision and made me feel sooooo beautiful on my wedding day! She is a true artist. The hair and makeup looked flawless but also very natural - I still felt and looked like myself, but just a more glammed up version. I also brought hair extensions to my trial and Celeste was very accommodating and supportive in working with them. What I appreciate most is Celeste's versatility: she can really adapt to the style and desires of every member of your wedding party. My mom, for instance, never wears makeup and she was a bit reticent at first (actually she didn't even want to have her hair and makeup done but I convinced her! ), but then she was beyond happy with the results! Celeste totally understood the kind of natural and understated look that my mom wanted to go for and made her feel so beautiful! She was so happy all night! My mother in law had a different style - she wears makeup often and enjoys a more glamorous look - and Celeste realized her vision soooo well too! That was amazing to see: how she gets every person's style and gives them what they want and feel comfortable with. We all felt amazing, and the hair and makeup lasted all night! Last but not least, Celeste is such a warm and calm presence. We really enjoyed spending time with her and I'm so happy to have gotten to know her. Thank you once again, Celeste! Thank you so much for the great review. I am so happy that you, your mom and mother-in-law were happy. I enjoyed being part of the process and it was Was so nice to meet you all. Best of luck in the future !!!! While searching for a hair/makeup artists in the Hudson valley, I was in tears. So few provided both hair and makeup, a combination that I wanted. For me, natural makeup was also a big concern. I do not wear much makeup on a daily basis - I wanted to look as natural as possible for my wedding day. Many pictures I saw of work by various area makeup artists did not seem as natural as I hoped. I am the type that 95% of the time hate when I have professional makeup done. Then I discovered Celeste. Her reviews raved about her and her natural makeup skills. I emailed her and she almost immediately responded with smiley faces. Via our email correspondence, she seemed very friendly and was always very responsive. I booked her before even having a trial. When we met in person for a hair/makeup trial, it felt like I was spending time with an old friend. She is so easy to talk to and an all around great person. Not to mention, she is extremely talented at what she does. She has such a calming presence, which I knew would be important on my wedding day. On my wedding day, Celeste and Vanessa came to the hotel we were staying at and set up their own stations. Celeste did the makeup of my bridal party as well as my hair/makeup and Vanessa did my bridal party's hair. Everyone looked beyond beautiful. Each person commented how calming and talented both Celeste and Vanessa are. They turned everyone's picture of what they wanted into reality. Celeste exceeded my expectations in my hair/makeup. I looked like myself, but a better version. It was natural, like I wanted but also elegant and bold also. I truly felt beautiful and like a bride. She truly executed all my hopes and wedding visions, better than I had imagined. My makeup and hair stayed exactly as they were at 11am until I went to sleep at 1am. I can't thank Celeste enough for everything. If you are looking for hair/makeup for your wedding day, please do yourself a favor and contact Celeste. I felt absolutely beautiful on my wedding day, thanks to Celeste. From the moment I met her I felt good vibes. She listened to me, was flexible, and professional. I received so many compliments on my hair and makeup. In addition, my mother has never looked so beautiful in her life. It was such a treat to see her with such confidence on my wedding day. Thanks all around, Celeste and Vanessa! Anne!!! Thank you so much!!!! I’m so happy you were thrilled and you looked so beautiful!! Best of luck to you!!! Celeste did such an amazing job on both my hair (bridal), and my bridal party for my wedding day! Celeste and I did a trial a month before the big day and it was so perfect, she had me very very excited for the big day and I wasn't disappointed! We had a big group and tight deadline on when we needed to have everyone done by, and she was even so accommodating by helping find a bring a third stylist for the morning to make sure we were able to complete everyone on time - after I didn't ask her to add the third stylist until the week of the wedding (Thanks again Celeste!!!). Her and her team of Vanessa and Dori were just so fantastic and listened to all the girls on how everyone wanted their hair and make-up done, and everyone was beyond happy with how it all went, and they finished up exactly on time. I also am not a huge make-up wearer and wanted to make sure I looked polished and like myself but still made-up on my wedding day and Celeste delivered, she did such a great job with my look making me feel like I looked very natural and didn't make me feel like I was wearing pounds of makeup. Also, our wedding began at 3pm which meant we were all starting hair and make-up around 7:15am, and the hair and make-up stood the test of a hot-humid outdoor wedding until we finished partying around 2am!! I was so impressed at how we all still looked fresh and styled even after hours of dancing and being outdoors with the sun and wind. I am so happy that we went with Celeste for our beauty as it was such an amazing experience, they did a fantastic job on everyone, and really listened to help understand what everyone's different styles and likes were to make sure that everyone felt like their best self and had that confidence to add onto the great hair and make-up that the team did for us. Dori was my hair and make up artist and she did an amazing job! I showed her a video of the hair I wanted and she did it even better. My make up was beautiful. I got so many compliments and I could not be happier with my looks. And she has a great personality, very cheerful and welcoming and even got out of her way and arranged an early morning trial for me although I confused the days and could not make it to the date we were originally going to meet. My experience was great great!! Thank you Dori. Seriously cannot recommend Celeste and her team enough. We had myself, 4 bridesmaids, and MOB and MOG all get make up and everyone really looked like the most beautiful versions of themselves. We ran on time/a little ahead of schedule. She was completely flexible in the moment. Everyone loved how they looked and they were a pleasure to have around while we were getting ready. I've been in several bridal parties and have to say Celeste and Dori did some of the best work I've seen/experienced. Thank you so much Margeaux! We are so grateful to Celeste for her help on my sister's wedding day!! I can't say enough about how wonderful she was!! Helping all of us look our best, being understanding about Lesley being sick, fighting bees with me, fixing our hair because of Mother Nature, and listening to all of us bent and be ourselves about eveyrhjng. Thank you thank you thank you!!! Lesley looked beautifully stunning and while she is a beautiful women, your artistic hand helped bring it together especially with her being so so so ill!! BOOK HER NOW!!!! Celeste was so wonderful on the day of my wedding. She went above and beyond. I was actually very sick during my wedding. I had a stomach virus and was in the ER the day before my ceremony. I was still sick and weak the day of my wedding and Celeste was beyond fantastic. She was able to do my makeup while I was lying in bed and she kept taking breaks for me to drink and take medicine. She did a phenomenal job. I obviously felt pretty awful but you would never know from the pictures! She did a fantastic job on my makeup. She listened to what I wanted and adjusted for new concerns. I was definitely glad we did a trial appointment a few months before the big day so she knew exactly what I wanted. She was even able to cover up a bruise on my arm from the IV the day before. We hired her by the hour to stay after the ceremony for additional pictures so she could do touchups on makeup and hair for the bridal party and me. We were so fortunate that she could stay because as it turns out, while taking pictures, a bee flew into my sister’s hair and we completely ruined her up do trying to get it out! Celeste was able to completely redo her hair before the reception started. Having Celeste there was seriously one of the best decisions we made regarding the wedding. She repeatedly saved the day!! I can’t recommend her enough to any bride/bridal party. She stayed calm through all the chaos and her gentle “go with the flow” attitude was exactly what we needed! Just know in advance that she communicates almost exclusively through email, so make sure you stay caught up when communicating with her. I cannot thank Celeste enough for cooperating with my ever changing bridal party. She was with me every step of the way ensuring my day went great. She even was there when i had a hair emergency and talked me through everything ensuring it would be ok. Celeste and her team did all 5 of my bridesmaids hair, my moms hair and makeup, MIL makeup, as well as sister and MOH makeup. With a full day, she never complained or got tired, but rather did amazing! everyone loved their hair and makeup as well as i. My hair and makeup stayed all night even through the dancing and jumping. I cant say enough about celeste and her team. SO happy to have picked her for our wedding hair services!! She was early, got along really well with all my bridesmaids and me, gave each girl exactly what they wanted, and made me feel like a princess. I didn't do a trial and had a different set of inspiration pics (none that I was sold on) but on the day of I let her have full control and she gave me a hairstyle I didn't think was possible. Taking out the pins after the wedding was a huge bummer because I didn't want to not have her work anymore. My biggest request was that I want an updo that won't budge (outdoor wedding) and all the strands stayed put even during windy times. Seriously, hire her. She's awesome! Celeste is amazing. I booked her before I did a trial, and I knew during my trial that I chose well. Celeste is a beauty with a great eye for beauty, but she never makes you feel like less - she's calm, sweet, and supportive. And talented. I don't consider myself a pretty girl, but she made me feel beautiful on my wedding day. She was also more than willing to make adjustments for what I wanted. Terrific. Vanessa, her assistant, did a great job on my girls hair, including my new stepdaughter. Multiple different styles and they all looked great. Trust your beauty to Celeste and Vanessa. They're awesome. Thank you so much Lisa.I loved being a part of your amazing day and you looked beautiful!I so appreciate the kind review and wish you the best of luck in the future! Sonia (Celeste) did the makeup for my bridal party and myself for my wedding this November (2016). She was wonderful! She was so calm and professional, making sure that everything was done exactly as we wanted it. It was great having her onsite as well! I had gone back and forth about having onsite makeup because of the cost of them, but Sonia's prices were some of the best out there. I got so many compliments on my hair and makeup, I couldn't have been more pleased. She even gave me a touch-up kit, with everything I could need for the reception. She and her assistant arrived early, got everyone done in the time allotted, and were so nice and fun to work with. Thank you Sonia!! Thank you so much Marissa! !You looked so beautiful and it was so much fun being a party of your wonderful wedding day! !Best of everything to you and your husband in the future!!! Celeste was amazing! I hired her to do my hair/makeup for my stepson's wedding. She was prompt and professional. She brought everything she needed including a chair for me to sit in when she did my hair and makeup. She was totally down to earth and listened to everything I wanted. We then discussed possible modifications to fit my unique personality and physical characteristics. The results were amazing! My makeup was perfect. It was natural yet sophisticated. I was not overly made up. Celeste brought out my best features. My hair was beautiful. I had brought hair extensions with me for Celeste to clip in that I had purchased at a beauty store to achieve the style I wanted. It came out better than I could have imagined! I can not say enough about how great she made me look! Thank you Celeste! Thank you so much Abbey! I was so happy to meet you and I thought you looked so beautiful! I'm sure you had a great time! Celeste and team were wonderful! 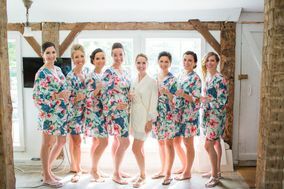 My whole bridal party loved their work and were completely pleased with the outcome. All day people raved about how good our hair and make-up looked. Celeste is very patient and accommodating and wants to make sure that each person loves their look. She was open to feedback and more than happy to make changes as needed. My hair and makeup lasted all day and night and my hair always felt secure which was a huge plus! If you're looking for bridal hair and make-up, Celeste is for you! Thanks Celeste! Thank you so much for the sweet review.I'm so glad you were happy and I loved being a part of the entire process!I wish you an awesome future of happiness together !! Celeste was amazing. Not only was her work fantastic, but spending time with her was both fun and calming. Everyone looked gorgeous, even at the end of a long reception and after party. It was really important to me to look like myself and not heavily made up, and Celeste made sure I liked what she had done and tweaked everything I wanted tweaked. I looked like me only way more impressive, and the pictures are stunning. I was so happy with everything - couldn't recommend her more highly. Celeste was wonderful to work with! I was so happy with how my hair & makeup came out on my wedding day, it looked flawless. Celeste traveled to our hotel in Fishkill with her assistants (who were also wonderful) which made my wedding day so much easier. She was also very accommodating for my hair & makeup trial which I was able to coordinate with my engagement photo shoot, which was perfect. Thanks Celeste! I had so much fun and you looked amazing!!! Best of everything in the future !!! I hired Celeste Von Damon for hair & makeup for my wedding on July 8, 2016. Celeste and her assistant, Vanessa, did the hair & makeup for both moms and the entire bridal party. I’m so happy to have found Celeste so quickly. My previous hair/makeup “friend” flaked out on me 2 months before my wedding so I was frantically looking for someone. Also living 2 hours away from where the wedding was to be held, it was difficult to find someone. I found Celeste through Wedding Wire and she was available. I’m actually happier that this worked out the way it did, because I don’t think anyone else could have made me look more beautiful than she did. Celeste is very professional and uses only completely sterile and disposable applicators. She brings everything she needs with her as well, including a full-length mirror the day of the wedding to see the whole picture! She spent lots of time with me during the trial and we created the perfect wedding look together. After the trial, I immediately signed the contract! She was very accommodating to all my additions and even some last minute ones. The day of the wedding, Celeste and Vanessa, came to the house on time (which was 7:30AM) and were ready to go. We were all going non-stop until about 2:00. Celeste made sure that everyone was perfect before she left and touched anyone up that needed it. She also provided us with a touch-up kit for the rest of the day. Vanessa went above and beyond when one of the girl’s dresses ripped a little bit, she got out the needle and thread and sewed it up! Celeste & Vanessa were very professional and understanding to the needs of everyone in the party from the younger girls to the moms. Even, some people that normally don’t wear makeup, really liked their end result. The makeup stayed on all day long even in the summer sun outside! She made everyone feel at ease and we never ever felt rushed or anything. I cannot thank Celeste enough for coming through for me on my special day. Thank you so much for the awesome review! It was such fun to be a part of your big day- I loved the way you looked and I'm so happy you were happy! I can't thank Celeste enough for making myself and my bridesmaids look incredible for my wedding in Catskill NY in June 2016! She and her assistant were in charge of all hair/makeup for my bridal party (4 bridesmaids and myself), and Celeste personally did both my hair and makeup--both women did amazing work and everyone looked stunning. I could not be happier with how I looked on my wedding day; Celeste is truly is an artist. I also completely changed my hair idea in between the trial and wedding--I added a veil so we needed to change the style completely. I gave her some ideas and photos of the new style, and she went with it (but did talk to me throughout to see how I liked it--I liked everything!). It turned out better than I ever dreamed and I am the happiest newlywed because of her. She is calm, caring, professional, and great at what she does. Thank you Celeste! Thank you so much for having us and entrusting us with your beauty. We loved being a part of such a fabulous day with such wonderful people! I had a wonderful experience with Celeste!! After having a trial with her I knew right away that I wanted her to do my hair and makeup on my wedding day! She is extremely friendly, easy to talk to, was very quick to respond to emails and answer any questions that I had. She understood the style I was looking for exactly. Her work is amazing! I was married on June 4 at West Hills Country Club. Celeste arrived early and ready to go! Her and her assistant were wonderful and a pleasure to be around while we got ready- we listened to james brown all morning :) I received compliments all night ! I would highly recommend Celeste!! I'm so thrilled we found Celeste and that she was available for our wedding date. She is the consummate professional, so good at what she does and with such a peaceful nature. On our wedding day, she was a calming presence in a sea of rushing around and semi-chaotic prep. She and Dori handled two brides, two bridesmaids, and a MOB with aplomb and made us all look fantastic. Neither of us is used to wearing makeup or elaborate hairstyles and Celeste was totally understanding of that. She struck the perfect balance between inquiring about our wishes and offering her own expertise. She made us feel so comfortable that we knew we were in good hands and she would make us look fabulous - and she did! I absolutely love the way we all looked and I am so grateful to Celeste for making it happen. I cannot recommend her more highly - she will make you look fantastic and feel great all at the same time! Thank you so much Meg! I absolutely loved being a part of yours and Rhiana's special day and you both looked gorgeous!! !Best of everything in the future!!! I am so grateful to have found Celeste. From the first email to the final lash, she was the epitome of professionalism, warmth and talent. I had two trials because I couldn't make up my mind about details and she was so welcoming and honest with all my ideas. On my wedding day she arrived promptly with her wonderful team and created order out of chaos. My six bridesmaids, my mom and I were so happy with the hair and makeup. We all felt so beautiful. Celeste is calming and exceedingly talented. I am so glad she was there to make me feel pretty on my wedding day. Thank you so much for the great review Maia. I was so happy to be a part of your beautiful wedding.I wish you all the best in the future !!!! Planning a wedding long distance can be stressful, but Celeste was flexible when it came to my limited time on the East coast where I had several planning meetings in just a few days. During my trial she took her time (about three hours) and went over photos and discussed what I was looking for in terms of hair and makeup for my wedding. She did a great job, but after thinking about it for a few weeks, I had a some changes I wanted to make. I sent Celeste photos and explained as best I could what I wanted. On the day of my wedding, I absolutely loved my makeup and hair. When I look at the pictures, I feel so good about how I looked and felt on the big day. Celeste listened to me and made tweaks from the work she did during my trial, and the end result was exactly how I envisioned it. Her team did an amazing job with my bridesmaids and mom also looked fantastic. I had a day wedding with photos starting at noon. With myself, seven bridesmaids and two mothers, Celeste and her team did a great job in the time frame and space provided for them. Pricing is pretty typical in comparison to other vendors. With all things wedding related, prices are higher than normal, but in this case, it's well worth it. Celeste is sweet and calming and a true professional. Not only does she understand hair and makeup, but also the needs of the bride on her important (and somewhat nerve-racking) day. 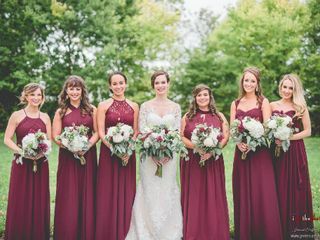 The best hair and makeup for both me and my bridal party! Celeste will do a trial with you and video tape it from all angles so you can see what you love, or what you dont like. She takes her time and will try several different looks with you. I felt absolutely gorgeous on my wedding day and the compliments kept coming! I am recommending her to all of my friends!! Sophia, thank you so much for the wonderful review and all the recommendations! It was a pleasure to have been involved in your big day and you truly looked amazing- so happy with how it all came out!